Problem: Diet is a major modifiable risk factor for chronic diseases. Chronic diseases cause more than 70% of deaths worldwide and 85% of deaths in Europe, resulting in 80% of healthcare spending in Switzerland (WHO 2016, FDHA 2018). Solution approach: Diet monitoring and nutrition intervention can counteract these alarmingly increasing figures. Digital receipts automatically captured through loyalty cards enclose relevant information that can help understand dietary patterns and behaviors and offer personalized self-monitoring on the individual-level. Framework: Switzerland offers a quite unique milieu: the loyalty programs offered by Coop and Migros, the two main grocery stores, reach more than 3 million of households each, and 80% of the retail revenues are associated to loyalty cards. Purpose: The aim of this project is to develop a machine-learning model that reliably predicts an individual user’s dietary pattern from their automatically captured receipts. Application: Similar to “Cumulus Green” of Migros, better understanding of users’ diets and personalized feedbacks are intended to increase awareness and to facilitate nutrition interventions and monitoring. The Receipt2Nutrition research project aims to develop a novel and scalable approach for delivering individual-level dietary monitoring by applying data science on automatically captured digital receipts. Digital Receipts: Shopping data used only includes product names, prices, and date of purchase. Hence, sales data first needs to have nutritional facts. For this, Auto-ID Lab has developed and maintained a product ingredient database, which now contains more than 30’000 most frequent Swiss products. FFQ: Sales data enriched with nutritional information is compared to the actual dietary intake. The latter is obtained through a Food Frequency Questionnaire (FFQ), which investigates into participants’ diet in the previous month for elaborating the usual dietary intake. Personas: anonymous users’ descriptions (socio-demographics, shopping and dietary behavior) help understanding more patterns for developing a reliable model. Data Collection: The data is collected through the BitsaboutMe platform, where participants sign up, link their data sources (Coop, Migros), and register to the study. Anonymous identification: By sharing Migros and Coop shopping data, only product names, prices, and their dates of purchase will be forwarded anonymously. That information will be linked through an anonymous identifier to a 25 minutes diet survey (FFQ). No data is shared externally: Participants’ email and data are not shared or used in any other way. Participation incentives: Upon completion of the diet survey, participants receive a report assessing their current diet and a personalized Health-Shopping-Widget is activated on their BitsaboutMe dashboard. This feature will track the healthiness of their future grocery baskets. This research project is conducted by the Auto-ID Lab at ETH Zurich (Chair of Information Management, Prof. Edgar Fleisch). BitsaboutMe, a Swiss Start-Up located in Bern and operating in the Personal Data Economy, provide the platform to collect the data. Receipt2Nutrition is a research project of ETH Zurich in which loyalty card shopping data is analyzed in order to develop a model that predicts and monitors diets. Your participation supports the realization of this project, an important step towards preventing diet-related diseases – one of the largest challenge of the 21st century. As a reward, upon completion of the diet survey, you will receive a report assessing your current diet and your personalized Health-Shopping-Widget will be activated on your BitsaboutMe dashboard. 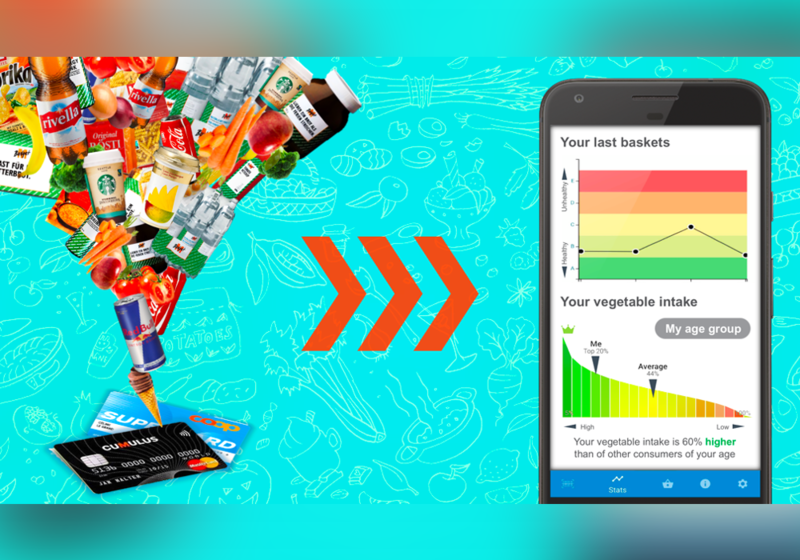 This feature will track the healthiness of your future grocery baskets. Follow the simple steps illustrated in this tutorial https://www.autoidlabs.ch/receipt2nutrition-how-to-join/ – it will only take ca. 25 minutes & you will also receive a personal diet assessment and a new tool for tracking the healthiness of your next grocery shopping baskets. 5 minutes to create a BitsaboutMe account, link the data sources (Coop and/or Migros), and register to this study. 25 minutes to fill out the diet survey. What will I get by participating in the study? your personalized Health-Shopping-Widget will be activated on your BitsaboutMe dashboard. This feature will track the healthiness of your future grocery baskets. How will you handle my data? How can I stay informed about project updates?